They abducted me during the blood moon. I must write this quickly. I am floating weightless in a utility closet on a secret space station no one on Earth knows about. Yes, I am in space! A life long dream but not like this! Not with that person in charge. The station is hidden by supernatural means, I am convinced. I can sense the evil all around me. But, I have to hurry before my hack into this computer terminal is found out. It was the night of the lunar eclipse. I walked out under a cloudy sky and tried to find the moon. A gentle shower of rain fell all around me and I realized my efforts would be useless. Until through the cloud cover, I saw a glimmer of red behind my house. I live on a golf course and across the fairway from house is a power line causeway with an open view to the sky. I hurried across the wet grass of the fairway and found a trail leading through the woods the short distance to the causeway. Something glimmered ahead of me. I stopped and the hair on my neck stood on end. What was that? Ahead of me in the pine trees, an oscillating light alternated between lime green and lavender. I should have turned back. I should have listened to the small voice inside that said, “Run!”. But, no, my curiosity got the best of me and I continued down the path toward the light. It seemed to drift away from me, almost playfully, a cat and mouse game. Warning number two! But, I forged ahead and stepped out of the shadowy woods into the open. The power cables suspended above me hummed with electricity and for a second, the blood red moon appeared through a break in the clouds. Like the angry eye of Satan, it glared at me. My heart raced and my lips went numb at the sight. Why would I consider a lunar eclipse a portent of evil? My mother used to take fruit cocktail and place it in a glass bowl with a special “mixture” she received from a friend. Over the next few days, the fruit would marinate and ferment, releasing a sickly sweet odor. My mother never realized she was making an alcoholic fruit mix to put over her ice cream. That odor came to me now, wafting on the misty breeze; a sickly sweet odor, cloying and sticky. I retched and tried to whirl around to find the source only to discover my feet refused to move! Something moved above me and it eclipsed the sound of the humming electrical wires. 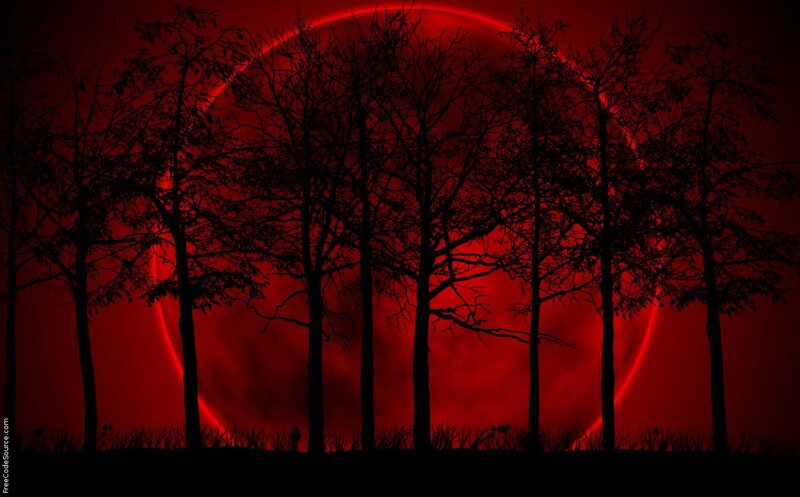 I looked up and a dark something blocked the blood moon from sight. The paralysis moved up my legs and I panicked. I tried to walk, to run, to tip over and crawl away from the thing that hovered above me. Nothing happened and the creeping paralysis took my arms and sizzled over my scalp. I froze with my head tilted up toward the obscenity above me and an opening appeared in its underside. From the circular opening lime tinted light shot down around me. I tried to squint, but my eyelids were frozen. As horrific as my experience had been up to that point, I was not prepared for what happened next. A long, spindly shadow fell over me as something moved into the light. With the kiss of that shadow a wave of evil engulfed me, smothering me, gripping me in a relentless embrace of utter darkness. The shadows shifted and moved and the thing appeared at the edge of the circle of light. Like some obscene, deformed fly it skittered out onto the undersurface of whatever hovered over me. Wings vibrated from its back and six limbs moved with nightmarish motion as it hung above me. The face was lost in the glare of the light and the face seemed to move and rotate or pulsate. Another of the foul creatures appeared beside the first. Then another until five of them encircled the light. I tried to breath deeply, to find some semblance of calm, but could not. My heart hammered in my chest and tears poured from my open eyes as I left the gravity of Earth and levitated toward the circle. Dear God, help me, I pleaded. Whatever these things are, they are evil . . . I hear them in the corridor now, coming and I must stop. I will try and send another message as soon as I can. I know you do not believe me. I would not expect you to. But, if you get this message I have a request. Pray for me. And, please, please find Jonathan Steel and tell him the 10th demon is here! “The 10th Demon: Children of the Bloodstone” coming in November. Posted on October 5, 2015, in Steel Chronicles. Bookmark the permalink. Leave a comment.